Chicago College of Performing Arts, Chicago, IL 2008 -B. Music (Violin Performance), McGill University, Montreal 2005 -Artists Dip. 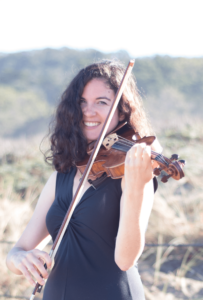 Beginner group violin teacher at Skinner Elementary, Chicago 2014 -Beginner group and private teacher at MMSEA Chicago 2013 -6 years of audition coaching to students in Chicago. My passion is to keep music education alive and teaching people of all ages! Passing on the tradition of music-making to future generations is important to me, as it had a great impact on my life. The benefits of learning to play music include improving one’s ability to focus, practice discipline, and build coordination. Learning music is actually teaching the brain to make connections between the left and right half– much more than it normally would. And lastly, practicing music can be an outlet for someone who is stressed, or bring hope to someone who is having trouble in some aspect of their life.